I had been staring at some overripe bananas on the kitchen counter for a couple of days, pondering whether to toss them or make something. Normally it’s chocolate chip banana bread. 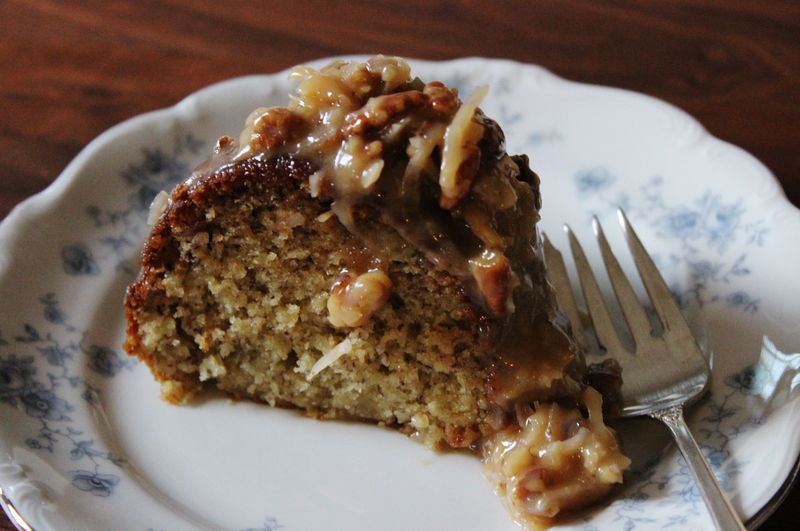 But the warm sweet scent of my grandmother’s banana cake came wafting through my memory. I dug the index card out of her recipe box. What a treasure! Preheat oven to 350F degrees. Butter and flour a bundt pan. Sift together the flour, baking soda and baking powder. Whisk in the salt. In a separate bowl, cream the butter with the sugar and add the vanilla. Beat well. Add the mashed bananas and beat again. Add the flour mixture to the banana mixture, alternating with the buttermilk. Make sure to add some flour last. Pour batter into the bundt pan and smooth so it is evenly distributed. Bake for 40 minutes or until a tester does not have wet batter on it. Let cool for 10 minutes in the pan. Remove the cake from the pan and let cool on a rack while you make the icing. In a saucepan, combine the evaporated milk, sugar, egg yolk and butter. Stir over low heat for 5-10 minutes until thickened. Remove from the heat and add the vanilla, pecans and coconut. 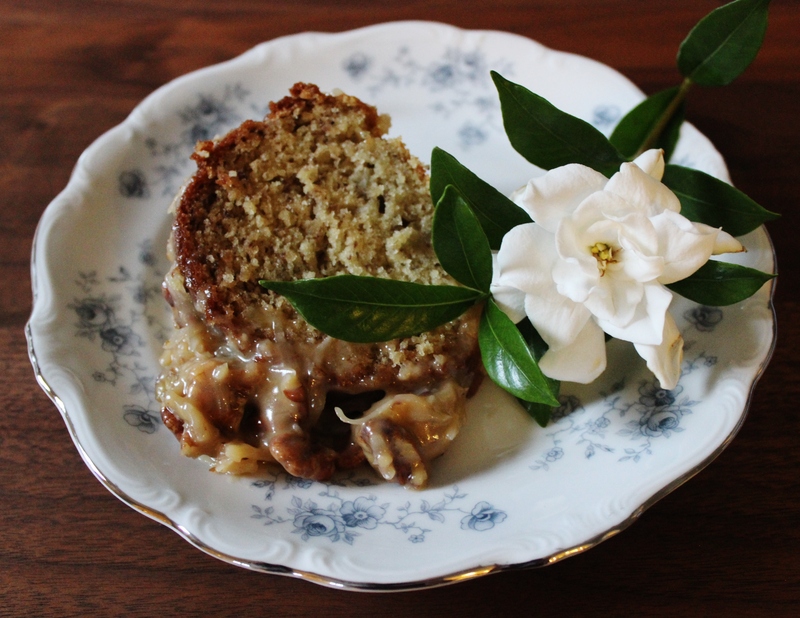 Place the cake on a platter or dish even if it is still warm. Pour the warm icing over the top. It is supposed to fall over the sides of the cake. 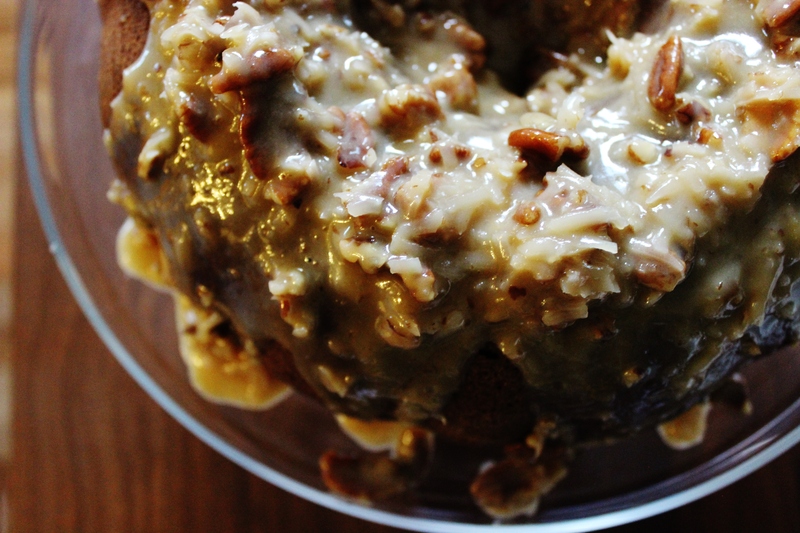 Ooey gooey banana goodness.